Supersize, maximize, be all you can be…because if you are going to do something, why not get the most out of it? Prayer is one of those things. We know we can do it poorly — babbling like the pagans do and not even paying attention to what we are saying. “What the world most needs today is prayer,” according to Fr. Jacques Philippe, author and retreat master. “Faithfulness to prayer is a path of freedom,” he wrote in Thirsting for Prayer. Scripture tells us that praying together with fasting is very powerful: “Know ye that the Lord will hear your prayers, if you continue with perseverance in fastings and prayers in the sight of the Lord.” (Judith 4:11). What did Jesus do to get the maximum out of his ministry? He prepared by first going into the wilderness to fast for forty days. Jesus said in Matthew 6:16: “When you fast…” not “If you fast…” The first Christians fasted (Acts 13:2-3; 14:23). It was nothing new. Moses and Elijah had done the same. Fasting and putting on sackcloth saved the city of Nineveh from destruction in the book of Jonah. King David said, “I humble myself through fasting” (Psalm 35:13). Msgr. Gob emphasized that adding fasting to “devout and fervent prayers” is the only way to defeat the “hostile secularism” that is undermining society. He also credited fasting with removing obstacles while cleansing us from sin. But for it to bear fruit, Msgr. Gob said fasting should be a source of opening our hearts to God and showing mercy and charity to others. He recommended doing it in union with others to benefit from encouragement and mutual support and to pray and read Scripture together. 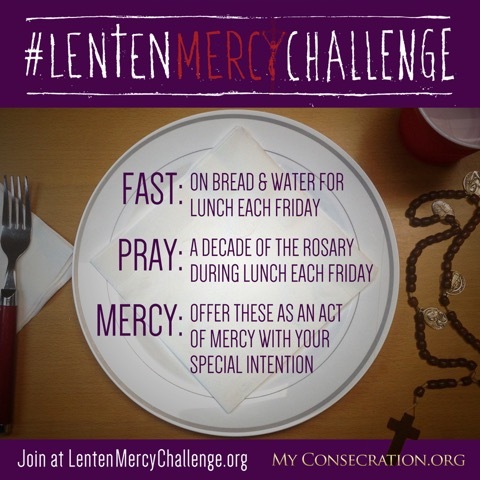 This Lent, MyConsecration.org is promoting the Friday Lenten Mercy Challenge to encourage both prayer and fasting together. It’s so simple yet by joining together with thousands of other Catholics doing the same thing, we will be adding to and maximizing our own prayers. This Lenten project is to pray a decade of the Rosary and fast on bread and water at lunch on Fridays during the six weeks of Lent. People can offer that sacrifice to God for a specific intention as an act of Mercy. This being designated as the Jubilee Year of Mercy by Pope Francis, it’s a beautiful way to call down God’s mercy. When it comes to prayer, in every Church approved apparition in recent history, the Blessed Mother encouraged us to pray the rosary daily. It is easy to pray the rosary so be not afraid if you have not been doing it. And for this Friday Lenten Challenge, people are only being asked for one decade at lunch. You pray an Our Father and 10 Hail Mary’s, the Glory Be and the Fatima Prayer while thinking about a specific time in Jesus’s life. It will take only a few minutes. And while fasting on bread and water during that meal, it’s a way to strengthen your prayers while you offer it up for your special intention for someone. For details and inspiration, go to LentenMercyChallenge.org. Also, PLEASE help to spread the word because what the world needs now is something we cannot give ourselves. Maximizing our prayers with fasting and turning to the Blessed Mother, however, can give us what we need. I am looking forward to my Friday Lenten lunches now, knowing that I’ll be uniting myself with so many other faithful Catholics and the Blessed Mother to access God’s mercy.